Libby is honored to be the Austin ambassador for Foat Design (www.foatdesign.com), an eco-friendly clothing company started by yoga teacher/designer twins Zoe and Kaja Foat. "As a company, Foat Design is dedicated to making durable, functional, and stylish products specifically for those who want to maintain a healthy, earth-conscious lifestyle coupled with a modern, urban life. Our designs move comfortably in yoga class, and make a fashion statement on the move. We are sweatshop free. All products are custom manufactured locally to ensure a high standard of quality, maintain the integrity of our designs, and to support the workforce of our community. Many items are one-of-a-kind and all items have a short run, meaning fabric and color may change often. We research and select the best materials we can find to design attractive clothes that are easy to maintain and have the least amount of harm on the earth." 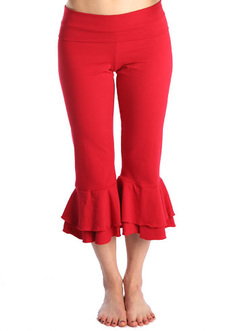 Libby is featured on this site wearing their Flared Pant. To support their endeavors, and to look great doing it, visit their website to shop online.